The average person can spend more time at work than anywhere else – largely why finding a fulfilling job is so important. 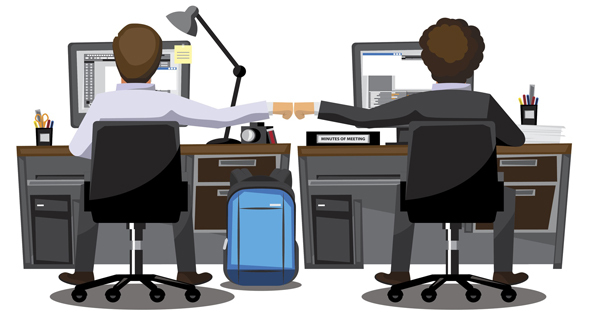 One factor that heavily influences our satisfaction and motivation at work is the nature of our relationships with coworkers. Unless you work independently, you will very likely need to work with others to manage your responsibilities. Though getting along with everyone we meet is nearly impossible, making an effort to at least maintain a positive working relationship (and trying for even more) is worthwhile. Why? The average person could spend more than 160 hours each month with coworkers (assuming an eight hour day five days per week). Even if a position is highly independent, it is almost always still essential to coordinate with others to achieve the common goal. This means you will depend on colleagues who will in turn depend on you. Effective coordination yields less stress and better final products and services, all necessary for success and promotions. Sometimes peers have an even more direct impact on your success at work if your company includes peer reviews in the evaluation process. Coworkers can also help you accomplish short and long term professional goals through various other means like mentoring or involving you in projects of personal interest. Because they can be fairly instrumental to your professional progress in numerous ways, colleagues can also serve as a hindrance, which maybe seem unlikely, but can occur. That said, sometimes it is difficult to be friends or at least friendly with your work mates. In this case, it is helpful to explore the root of the problem to be able to find an appropriate solution. For most companies, all types of diversity are positive elements. Different backgrounds, educations and ultimately, different opinions allow companies to produce creative solutions. Though necessary for companies of all kinds, the difference of opinion or approach can sometimes put a strain on interpersonal relationships at work (similar to the way it can affect personal relationships, too). Further, when colleagues have different styles of communication or work ethic, it can likewise deepen the divide. Finally, different departments within the same company can often have clashing objectives. Individual competition even within the same team can also surface. Put simply, there are several possible causes of conflict so it pays to identify the problem. If you are starting a new role or are experiencing coworker conflict in an existing role, trying to get along is always worth a try. For specific techniqes, take a look at Part II of this post. Find other career resources and the latest job listings at www.jobsinonehour.com.